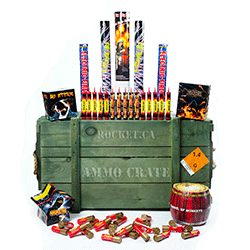 Rocket.ca - Toronto's Fireworks Superstore! FLAGSHIP STORE: OPEN YEAR ROUND! We offer discounts and savings on Toronto's biggest selection of Fireworks, as well as a huge assortment of Glow in the Dark, LED and Party products! Browse product videos as you shop. Our expert service and low prices will keep you coming back for more! More about Rocket Fireworks - Toronto's Premier Fireworks Source! Rocket Fireworks (Toronto, ON) provides Canada's largest selection of Fireworks for Victoria Day, Canada Day, Labour Day, Diwali, Guy Fawkes Day, New Year's, Weddings and Parties, religious and cultural celebrations, etc. We also provide Professional Fireworks Display Services in Toronto and throughout Southern Ontario for Weddings, Parties, Municipal and Corporate Events. We will make your special day a magical one! Rocket Fireworks is Toronto's leading provider of Glow in the Dark, LED and Confetti products for Bars, Nightclubs, Concerts, Special Events, Weddings and more. We stock a huge line of nighttime Party items to bring life to your event! Whatever is your occasion, Rocket Fireworks (Toronto, ON) has everything you need to bring you and your guests outstanding entertainment at the lowest possible prices. We pride ourselves on our customer service and will do our best to make sure that you and your guests receive the best effects that Toronto has to offer! Call us today at 416-456-5057. We look forward to serving you! Rocket Fireworks Inc. Head Office: 14 Advance Rd., Toronto, ON. Phone: 416-456-5057. http://rocketfireworks.ca.